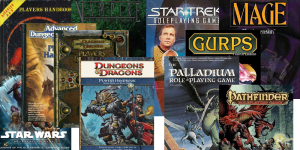 A roleplaying game is a game of your own fantasy, it can be a boardgame, it can be live action roleplaying. But let me try. To explain yo you more precisely what it is. A roleplaying game is a game where you and your friends is taking on the roles of different personalities. Which you as a person give these roles. And these roles can be different. Because it depends on which setting you and your friends decides to play a game in. There is many genres for you to play in. There is Sci-fi, steampunk, high fantasy, low fantasy, present time, middleage, etc. There are so many settings you can play in, a roleplaying game is also an evolving game, which do not have a specific line for your characters to go to. The game master which the one is called who controls the enemies, the monsters and so on. can only make guidelines for your party to go after. Or at least Try to make the players go where he wants them. Well. The mechaincs used. Depends on what system is used, as many of the different roleplaying games out there have a different set of rules. We cannot sit down and say this system is what all the games use. If we talk pen and paper all the different games. Which is released these days are all different from each other. So to say which mechanics is used is a bit of a big question. Mostly because the amount of mechanics existing. So all i can say is find them and try them out. There are many many roleplaying systems out there. And i talked a bit about mechanics above and systems and mechanics are closely tied together and is most of the way the same thing. But that does not keep me from trying to make a difference between the two of them. There are as many systems as there is roleplaying games. Every game have its own system and its own set of rules. And that is the reason why some of the systems actrually seems very much the same. Because some systems is inspired by each other and that is a big fact. But there are also some unique systems out there. I can name a few of them. We have the following X Systems i can mention as i of this writing. And many many more is out there. Just go down to your local RPG seller and ask them. And i am sure they will come up with something for you. This is something which i think can’t really be defined. Because this is up to you, up to the person who plays the game. Do you think it is the most popular in your community. But i think if you look on it with Business glasses. The most popular game is Dungeons and Dragons, It is the game that so many people know. At least by name, which make this most popular. If you need to explain about roleplaying. Nearly everyone can somehow relate to Dungeons and dragons. Solely because it is what it is. And people is relating to it. Because they have heard the name. Seen a tv show about it or something else. Well playing a roleplaying game, can evolve your selfconfidence. And you can be more self aware playing a roleplaying game. I think that i will never try out all roleplaying systems out there. But i will surely try as many as possible. Remember to have fun while playing. It should always be fun to play. Even when things get Serious. You may not post a full article At least not in Denmark, but i dont know what the law says in your country you will need to google it or ask any of your local Newspapers what the law about this is.